If Prime Minister Narendra Modi, the most powerful man in the country, can play the victim card, why can’t Bollywood actor Kangana Ranaut? In Parliament, Modi claims his ‘crime’ is that he was born in a poor family and is challenging the Congress Sultanate. And in Bollywood, Ranaut is breathing fire against those who have ganged up on her and her passion project Manikarnika because she has been calling them out on nepotism, sexism, and pay parity. “They have called for trouble by ganging up on me,” she said. And if I were them, I’d be shaking in my blingy jackets and shiny Louboutins. One has to only look at Hrithik Roshan to see how her relentless assault on him for disowning their alleged relationship has left him a shadow of his former Greek God self — not in the least because he went running to several unclejis in Bollywood to intervene on his behalf. Or at Karan Johar, who will forever be known as the flag-bearer of nepotism. To be fair, by posing on magazine covers with Alia Bhatt, Johar does nothing to shake this image. And I cannot even begin to describe the actor and Ranaut’s former friend Adhyayan Suman who remains etched in my memory as the man who accused her of mixing menstrual blood in his food. What makes Kangana Ranaut’s anger so potent? Here she is making a martial epic on “everyone’s queen”, hiring as her writer the “kaviraj” of the current establishment, as Prime Minister Narendra Modi described Prasoon Joshi at the ‘Bharat ki Baat, Sabke Saath’ event in the Central Hall of Westminster last year. “Nation building” is the zeitgeist we were told, by no less than the selfie-seeking gang that went to meet Modi at his home in January and then on its return shot a virtual promo for its latest entrant, Vicky Kaushal, to promote Uri: The Surgical Strike. Its constant plugging of the movie’s chest-thumping tagline ‘How’s the Josh’ has become BJP’s favourite calling card now. Kangana Ranaut’s Manikarnika had such opportunities in spades, with dialogues you may well hear during the election campaign later this year. Consider this for Beti Bachao-Beti Padhao campaign: ‘Jab beti khadi hoti hai, tabhi vijay badi hoti hai’. Try this for the enthusiastic garden-variety Modi supporter: ‘Joh sab chhodkar khada hai, wahi sabse bada hai (hear the echoes of Joshi’s fakir comment from the Westminster event?). Or ‘Hum dono ko Jhansi chahiye. Aapko raj karne ke liye aur mujhe apnon ki seva karne ke liye’ (recall ‘Pradhan sewak’). And this for supporters of the Nehru-Gandhi parivar: ‘Hamein hamare apnon ko jagana hai’. The sari-sword-sandals epic, which is high on love for the motherland, showcases a powerful performance by Ranaut, and her absolute conviction in her vision overcomes the shoddy casting of the cardboard British villains and the shoddier detailing of their costumes and make-up. In her 13 years in Mumbai cinema, Ranaut has tried everything once — she has played by the rules of the game acting in a series of films as a psychologically bruised and emotionally damaged woman, done several nonsensical movies such as Rascals presumably to pay the bills and satisfy the egos of male co-stars, before finally realising the best way to be noticed was to change the game. And the game is this: do what the male stars often do. Find a subject that has nationalism at its core, add to it a dash of rousing prose, ensure it has the tacit approval of the establishment by ensuring a special preview at Rashtrapati Bhavan, and voila, we have Ms Bharat, the female version of Akshay Kumar. Add to it a co-credit for directing the movie with Krish Jagarlamudi, and acquire a reputation for perfection, which may well mean being lionised as the next Aamir Khan. 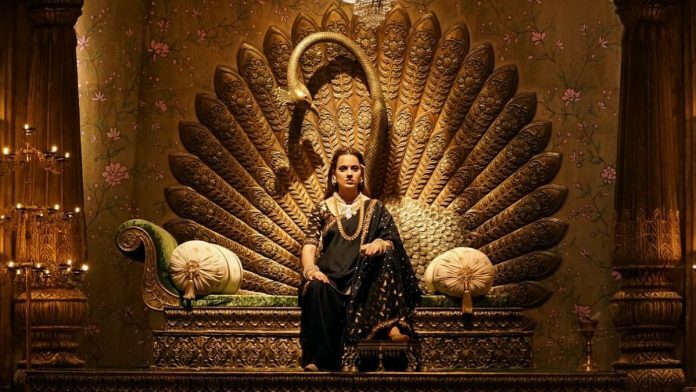 Manikarnika has done well at the box office, though its cost of production is reported to be high, at Rs 125 crore. Yet Ranaut remains the permanent outsider, with her nose forever pressed against the glass wall, looking in at the birthday parties and the Soho House dinners. There is no star boyfriend, no famous producer, certainly no actor father or mother, and no image manager calibrating the extent of exposure. Just lots of talent, supplemented by even more attitude worthy of Subhadra Kumari Chauhan’s “khoob ladi mardaani” and “swatantrata nari”. And this is despite Ranaut being generous in her praise of supposed rivals if she likes their work, a favour rarely reciprocated. Her armour is replete with all the popular symbols to challenge not just the campy movie industry but also the entrenched English-speaking elites across India. She has self-fashioned an image that is a heady cocktail of un-nuanced pop-feminism, love for cows, and Bharat. And now she is threatening some kind of expose against those who didn’t speak up for her, or Manikarnika. One of the biggest leitmotifs of Manikarnika is about sisters standing up for another. Ranaut’s Laxmibai wears her armour with a string of pearls, is a great swordswoman, and an expert rider, though it is emphasised that she is a Brahmin and not a Kshatriya. She is a great queen but also a romantic bride and a brooding mother. Above all, she is a rebel who fights and dies on the battlefield, but not before she embraces other women, especially Jhalkaribai Kori, a Dalit woman who becomes her greatest ally, which is close to Mahashweta Devi’s 1956 reinterpretation. Kangana Ranaut also manages to strike a blow for the vast masses who feel left out by the elites. English, she says in Manikarnika to a group of sneering and badly cast Englishmen, is a hunar (a skill), not our matri bhasha, which one supposes is her riposte to anyone and everyone who has ever laughed at her supposed inability to speak the language. Hamari sanskriti mein pehle shanti phir kranti ko jagah di hai, which may well be her own personal war cry. And in her invoking of the sacred Om, set on fire at the end of the movie, and of Hanuman carrying the Sanjeevani mountain, Ranaut will gladden many swadeshi hearts who would like to see the first war of Independence as a purely Hindu uprising, discounting the critical role of Muslim soldiers. This is a woman who has battled the Roshans. She has embarrassed Johar and made him apologise repeatedly. She has co-directed a powerful epic assembling talents as varied as Amitabh Bachchan (who did the voiceover), Prasoon Joshi (who wrote the dialogues and lyrics) and Shankar Ehsaan Loy (who created the music). She continues to be at the top of her game when it comes to acting. So, when she says, “Main inki waat laga dungi, ek ek ko expose karungi (I will make their lives hell, and I will expose every single one of them),” I’d be looking over my shoulder. Har har Mahadev! Kaveree Bamzai is a senior journalist. Well written and non judgemental piece. She does what she says if we go by her past. So stay tuned.